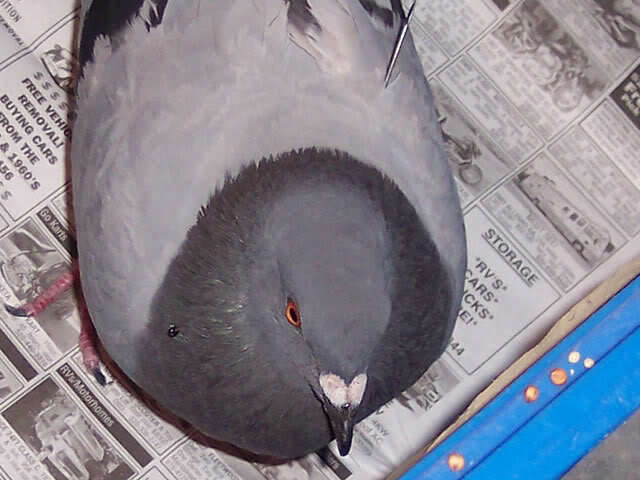 I just found this pigeon with a spike stuck in his chest. 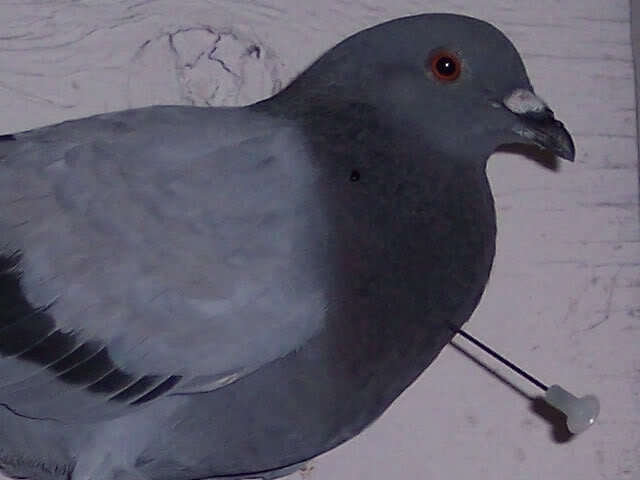 When I tried to catch him, he flew straight into a wall and drove the spike in to it's fullest extent. I've called and e-mailed several vets, hoping to get some emergency assistance tonight. I assume I shouldn't just pull the spike out. [Anyone have any suggestions in the interim? Jim...I would leave him until the morning and you can get him to an avian vet. You should not pull the spike out yourself. Keep him as quiet as possible and in a dark place to calm him. If you suspect internal bleeding, you can monotor him by looking at the inside of his mouth. If it is pale, then he most likely is bleeding internally. I'm so glad you spotted him, Jim. I agree, I wouldn't try to remove the spike. I would also put him in a small carrier or something of the like so he can't move around too much, so as to cause further injury. He is a beautiful pij. And looks quite healthy. How is your rescue doing this morning, Jim? I hope you both had a good (or at least as good as can be expected) night. Last I spoke with Jim, He was going to try and get the bird to a vet first thing this morning. OMG What a horrific thing to happen. I hope and pray that Jim gets this bird to the Vet as soon as possible, and that he is able to be saved. So glad you found this poor pij Jim he would have had a terrible painful death if you weren't there. He's still alive. I got him into the Arizona Bird Clinic this morning. The vet tech said his crop is punctured and it's a miracle that the spike missed his heart. He doesn't seem to be in pain or distress at this point. The Clinic is actually closed today, so they're going to take the spike out in the morning when the doctor is in, and stitch up the crop. Meanwhile, they're giving him antibiotics and making sure he gets food and water. Overall, the delay seems worth it, since another vet, who doesn't have the needed expertise, could do more harm than good. Sadly, it doesn't surprise me in the least that this wound was probably human inflicted. The blessing of all this is, is that you found him. Jim...I'm glad you got him where he needs to be. Great job! I hope the Vet will be able to remove the dart without incident. OMG, poor bird! Thank goodness you found him, Jim! It's amazing how the dart went through his crop without puncturing any vital organs, and it's great to know that he will be looked after by a caring and experienced vet. What are those other two metalic-looking blobs reflecting the light, one on his right shoulder and the other, smaller, at the base of his wattles? Not more pins, surely? And you're right, that pin looks exactly like the one in the link. Are those dart guns legal?? I noticed the 'spot' on the shoulder as well, Teresa, and was thinking it looked like a drop of dried blood. But couldn't figure out where it would have come from. I hadn't noticed the one at the base of his wattle. The spots look like drops of water to me. Would that one in the wing have stayed exactly in place before and after capture? Any news from Jim thismorning on this bird? Louise...he told me he won't know anything until this afternoon. He knows we are anxious so I'm sure he will let us know as soon as he does. The great folks at Arizona Bird Clinic just called me. The vet, Dr. Latas, actually came into the office yesterday, on her day off, and they successfully removed the metal spike. 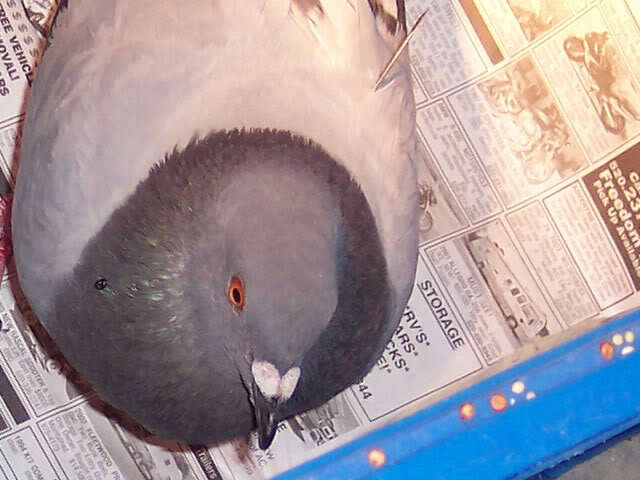 The pigeon is doing well and I'll be picking him up today. He will be on antibiotics for a while, but it looks like he'll make a full recovery. Jim...that is absolutely wonderful news!!!!!!! That is one lucky bird. What are those other two metalic-looking blobs reflecting the light, one on his right shoulder and the other, smaller, at the base of his wattles? The blob at the base of his wattles is dried blood. There's no immediately visible injury right underneath it, so I'm not sure what it's from. What you're seeing at his right shoulder is just an optical illusion -- that's really an image on the newsprint that he's standing on. Thanks for the great news Jim! 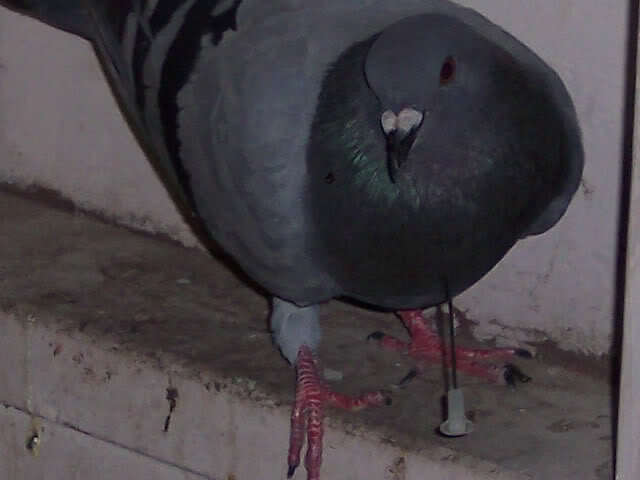 That is one lucky pigeon!!! !